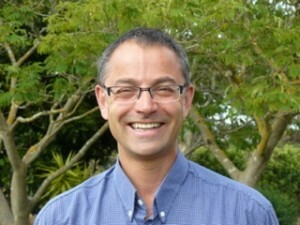 David Waldron is currently serving as the Minister of the word and sacraments in the Reformed Church of Christchurch, having previously been the pastor of the Reformed Church of Hastings until early 2014. David grew up in Yorkshire, England and received his M.A. degree at Cambridge University in physics and mathematics before completing an M.Sc. degree in geophysics at the University of British Columbia, Canada. He also holds a theological degree from the Reformed Theological College in Geelong, Australia. He has traveled and worked in Europe, North and South America, Africa, Scandinavia and Antarctica. David settled in New Zealand in 1987, when he met Jenny, his lovely wife. Jenny and David have been blessed with seven children. David has a professional background in the physical sciences, adult education, business computing and horticulture. David had been self-employed for 16 years before entering the ministry. He had operated a number of small businesses in the forestry logistics, farming, floricultural export and international student accommodation sectors. David was part of a Church of England congregation for most of his childhood, was confirmed by the church and received many years of Biblical instruction without ever understanding the need for personal saving faith. David drifted away from Christian fellowship through his university years, and was largely secular in his thinking by his early 20s. As he traveled to many parts of the world over the next few years, he was always looking for The Truth, but without success. Three years after meeting Jenny, David was relatively content with his lot and had stopped searching. It was then that the Lord found him and convinced him of the authority of Scripture through a careful consideration of the evidence for the creation of the universe, and life on earth. Having become convicted of the inerrancy of the Bible, God’s plan of redemption became clear in David’s mind and his heart was convicted of his sin. He turned to God in repentance and sought forgiveness from his Maker. The Lord has richly blessed David with his family and in his ministry. “For everyone to whom much is given, from him much will be required” (Luke 12:48).